So, Live and Let Bite is out next Monday. And here are the chapter titles. Given how Murphy's ended, you can guess how this is. Amanda decides it's time to see Marco. Amanda and Marco come together. Chapter 11: Danse MacabreMarco makes even more friends. Chapter 13: FalloutThe enemy is not us. Chapter 14: The Most Dangerous GameGuess who that is. I make Renfield look like a piker. Remember what I said about minions before? Heh heh heh. They try to strike Marco where it hurts. 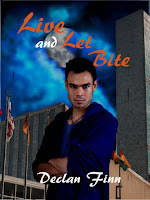 Live and Let Bite is coming, and you've got until Monday before it's released. And continues with the FB launch party. And if you haven't read book 1 and 2, we can fix that. If you have, please, review them.